Sorry, folks. There is no historical precedent to be found. I have never seen – nor heard of or read about – a press conference so tone deaf, so idiotic, so insensitive, and so dangerous. It is also a reminder that the National Rifle Association hasn’t represented gun owners for a long time. They represent gun manufacturers. Over the past week, it has been heartening to see Republicans and Democrats come together around the importance of a national conversation about gun violence. We don’t know who agrees on what yet, but we know everyone takes the issue seriously — except the NRA. What an insult to the memory of those who died in Newtown. What a disgrace to responsible gun owners everywhere. The unspeakable tragedy in Tucson today has brought with is a steady stream of news analysis, many of it worth a read. A Passionate Politician with a Long List of Friends. The New York Times on Rep. Giffords’ persona and political skill in the District. The Cloudy Logical of “Political” Shootings. The inimitable James Fallows pens a phenomenal piece on the Atlantic’s website about the tenuous connection between political violence and specific policy. He argues that the “tone” of an era is often a more important tool for understanding why acts of violence occur. A “Mecca for Prejudice and Bigotry.” This is how the Sheriff of Pima County labeled his state today. He held a blunt and honest news conference, appraising what was happening in Arizona as a whole, and how it relates to what happened in Tucson on Saturday morning. Lawmakers Consider their Safety after Gabrielle Giffords Shooting. Politico covers what is on everyone’s mind right now, including mine: how this event affects security for Congressional officials moving forward. Great quotes by John Dingell about Lyndon Johnson’s own encounter with vitriolic politics. After a productive day, turning in early. Here’s what I’m reading. 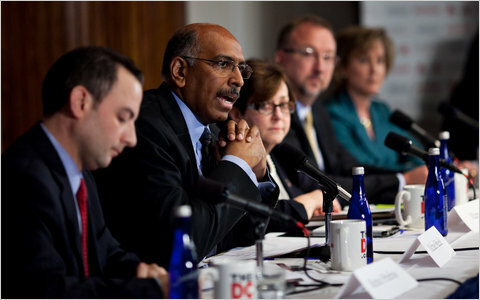 Steele Debates Four Challengers for RNC Leadership. I caught about an hour of this on C-SPAN today, and it was truly vile. Ann Wagner, one candidate attempting to over throw Chairman Steele, marked the low point of the event when she declared that she owned and kept 16 guns. “We got a new gun safe for Christmas,” she said. Look for my own piece on the debate, to post – hopefully – tomorrow on Huffington Post. One Side Now. I’ve met Erwin Chemerinsky, and am looking forward to reading his new book, The Conservative Assault on the Constitution. That said, Posner’s criticisms seem fair-minded and in good faith; I am looking forward to exploring the book for myself, but enjoyed reading his review. Oprah Winfrey Network Launches. Oprah Winfrey launched OWN this week. I haven’t had a chance to watch anything on it yet, but enjoyed this review of reviews. Sundays, for many reasons – Sunday papers, long brunches, relaxing dog walks – are great days. Here are a few things I’m reading and watching tonight. 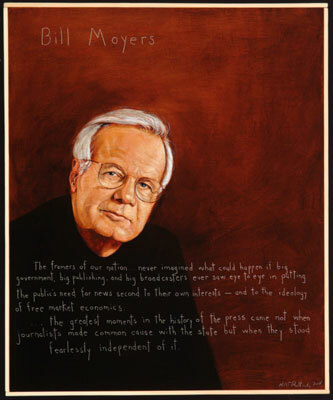 Bill Moyers at the 40th Anniversary of Common Cause. A mutual friend sent me a copy of the text of Moyers’ speech, but it is wonderful to watch him deliver it. A great reflection on leadership, political idealism, and the meaning of democracy. A must watch, if for nothing else than the wonderful anecdotes Moyers so adeptly deploys. Secession Vote in Sudan May Be Peaceful. In arguing that Sudan’s referendum vote on January 9th will likely be peaceful, The New York Times’ David Gettleman seems to overestimate President Bashir’s political-moral compass. An interesting story regardless. We all certainly hope for the outcome Gettleman predicts. Diplomats Help Push Sales of Jetliners on the Global Market. This article, outlining the role political negotiations between American ambassadors and their foreign counterparts play in the international business of jetliners, poses a few intriguing questions about the roles our embassies play. The diplomatic cables the Times used to report this story portray ambassadors and embassy staff acting as trade representatives to their respective countries; bargaining and cajoling on behalf of one of this country’s largest corporations. 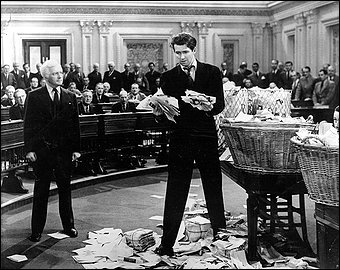 Jimmy Stewart filibusters in "Mr. Smith Goes to Washington." Some argue that this levels the playing field when Boeing competitor-in-chief Airbus receives subsidies from the European government. Other argue that this confuses the roles ambassadors play abroad. Resolved – Fix the Filibuster. Walter Mondale writes an excellent editorial that I missed in yesterday’s paper. I am – and always have been – opposed to modifying the essential elements of the filibuster. I believe that the US Senate remains, even when stalled by partisanship, the most important political institution in the free world, and the filibuster plays an important part in defending minority opinions at the heart of political debate. That said, I think eliminating “secret holds” and demanding Senators actually filibuster when they declare their intent to do so are sensible ways to improve the system. Here’s a rundown of what I’ll be reading and watching from the comfort of my bed on this first day of 2011. Charlie Rose’s interview with Ambassador Jon Huntsman. Newsweek reported this morning that Huntsman, President Obama’s Ambassador to China and the former Governor of Utah, was considering a bid for the GOP’s 2012 Presidential nomination. Read the interview for yourself, but it seems to me that Huntsman all but solicited a donation. The New York Times on Gov. Andrew Cuomo’s speaking style. 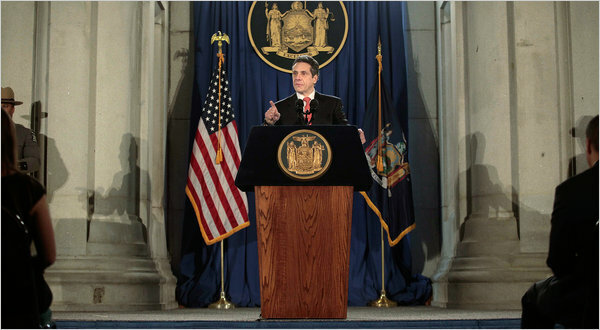 A short but interesting story on the linguistic and cultural origins of Governor Andrew Cuomo’s speaking style. Chief Justice John Roberts at Canisius College. A lot is being made of the Chief’s recent comments on the judicial appointment process, and rightfully so. In a revealing Q&A, Roberts discusses his feelings on “Advice & Consent” as well as a host of other issues lawyers and laymen alike will find interesting. This Year, Change Your Mind. Dr. Oliver Sacks, the neurologist and public intellectual behind Awakenings and The Man Who Mistook His Wife for a Hat, is in the New York Times today with his own suggestion for a 2011 resolution. 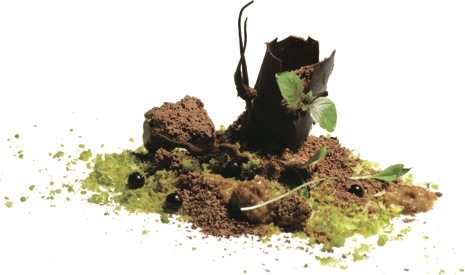 The Science and Imagination behind Modern Dessert. The New Yorker‘s resident bon vivant has a wonderful piece for the January 3rd issue on the power of dessert. The pictures alone warrant a visit. President Roosevelt makes a timeless case for, at the end of the year, looking towards a better future while also applauding a brighter present. The old year draws to a close. It began with dread of evil things to come and it ends with the horror of another war adding its toll of anguish to a world already bowed under the burden of suffering laid upon it by man’s inhumanity to man. A Christmas rite for me is always to re-read that immortal little story by Charles Dickens, “A Christmas Carol.” Reading between the lines and thinking as I always do of Bob Cratchit’s humble home as a counterpart of millions of our own American homes, the story takes on a stirring significance to me. Old Scrooge found that Christmas wasn’t a humbug. He took to himself the spirit of neighborliness. But today neighborliness no longer can be confined to one’s little neighborhood. Life has become too complex for that. In our country neighborliness has gradually spread its boundaries—from town, to county, to State and now at last to the whole Nation. 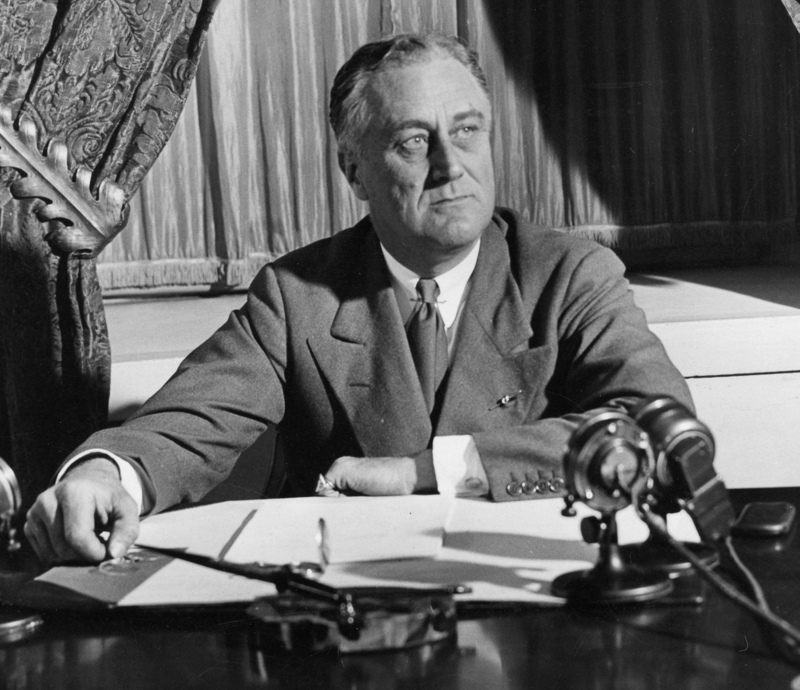 President Roosevelt after a delivering a radio message. In these days of strife and sadness in many other lands, let us in the nations which still live at peace forbear to give thanks only for our good fortune in our peace. Discovered through the excellent American Presidency Project, based at the University of California Santa Barbara. Worth a look.